Found 8 file extension associations related to InPage Urdu and 1 file format developed specifically for use with InPage Urdu. 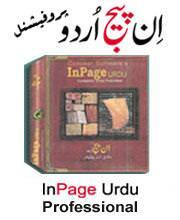 InPage Urdu is an extremely powerful publishing software that handles Urdu, Arabic, Persian, English and other language with level of ease and harmony never achieved before. Built on a robust proprietary state-of-the-art multilingual engine, InPage provides for complete flexibility for utilization of all these language, whether they are used separately, side-by-side or fully-integrated in your document. If you need more information please contact the developers of InPage Urdu (Concept Software), or check out their product website.